This toe-up short-row sock worksheet uses gauge plus a basic series of measurements to provide a custom fit. 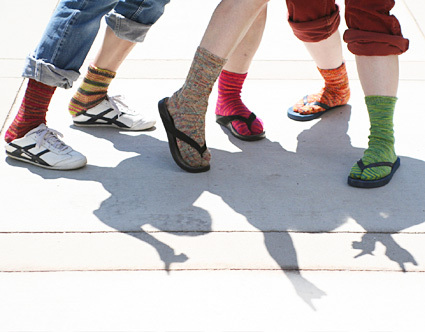 Don't limit yourself to stockinette! Instead, select a textured rib or stitch pattern for the top of the foot and the ankle. Just make sure that your adjusted number of stitches works with your chosen pattern. 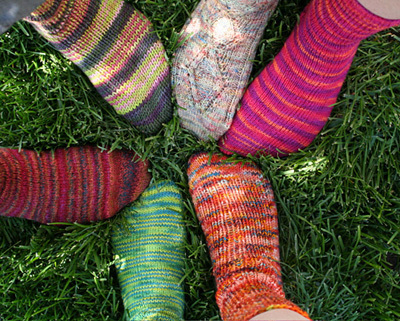 Note: Exact yarn quantities will depend on your stitch pattern, foot size, and sock length. Quantities given below are for a pair of socks that will fit a Women's size 9 foot, with a leg that is 8 inches from upper edge to top of foot. A set of five double-point needles, or two circular needles, in a smaller size than recommended on the ball band. Remember, socks are best knit tightly. Gauge matters for socks! You can use the worksheet for any gauge; however, make sure your gauge is tighter than you'd want for a sweater or other drapey garment. Work a gauge swatch in your desired stitch pattern and measure the gauge accurately before proceeding. Note: The directions that follow are written for short rows worked in stockinette stitch. Adjust this number of stitches as desired to work with chosen stitch pattern. Obtaining a multiple of 4 makes working on 4 dpns easiest. If working on 2 circulars, only a multiple of 2 is necessary. This adjusted number will be the "Key Number" for this pattern; it is the number of stitches on which most of the sock will be worked, and the other numbers which follow will be calculated from this number. Determine number of sts at end of Toe and Heel: Multiply D by 0.4. Now we're ready to begin! Using Crochet Cast On, CO (D) sts. *Row 2 [RS]: K to last st, W&T. Row 3 [WS]: P to last st, W&T. Row 4 [RS]: K to st before last wrapped st, W&T. Row 5 [WS]: P to st before last wrapped st, W&T. Repeat Rows 4 and 5 until (E) sts remain unwrapped between wrapped sts on either side of work. You will be ready to start a RS row. Note: Before proceeding, see note in "Pattern Notes" above re. working wraps together with wrapped stitches. When wrapping stitches at turning points of short rows which follow, note that stitches will now have two wraps; these stitches will be referred to as double-wrapped stitches. When working a double-wrapped stitch on a subsequent row, pick up both wraps and work them together with the stitch which had been wrapped. Row 6 [RS]: K to first wrapped st, k wrapped st, W&T. Row 7 [WS]: Sl 1, p to first wrapped st, p wrapped st, W&T. Row 8 [RS]: Sl 1, k to first double-wrapped st, k double-wrapped st, W&T. Row 9 [WS]: Sl 1, p to first double-wrapped st, p double-wrapped st, W&T. Repeat Rows 8 and 9 until one double-wrapped stitch remains at each end of work. Carefully remove crochet chain from CO edge of work, and place the (D) resulting live sts on two double-point needles, or one circular needle. There should now be (C) sts on the needles. Foot of sock will now be worked in the round. Hint: When you begin to work in the round, you may want to pick up a st or two in the space at either end of the newly picked-up sts to close up the small gap that can form at this point. If you do this, remember to decrease these sts when working the next round, so that you will once again have C sts. Work in stockinette st or chosen stitch pattern, until work measures (A) inches from end of toe. Next Round: Decide which side of your sock you wish to be the top of the foot, and which side will form the sole. Work to the end of the stitches which form the top of the foot; the heel will be worked back and forth over the stitches which form the sole. To form heel, work from * to * as for toe. Resume working in the round over all sts. Work in stockinette st or chosen stitch pattern until work measures (B) inches from top of foot. BO all sts loosely in pattern. 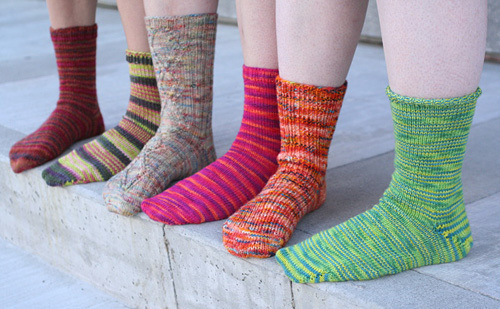 Weave in ends, and make your second sock in the same way. Amy Swenson is lucky to live a yarn-filled life in Calgary. 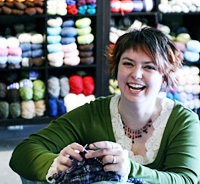 She runs Make One Yarn Studio, indiKnits Designs and writes patterns and books. Her first book, "Not Your Mama's Crochet", will be released September 19.